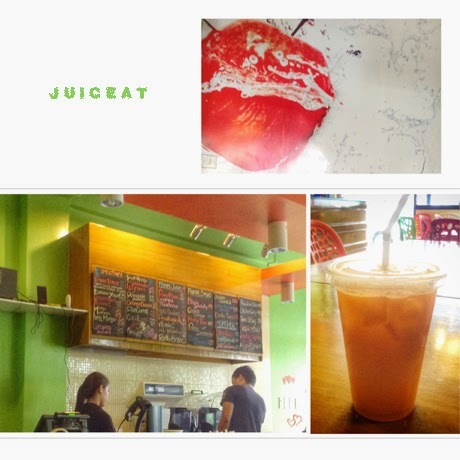 Juiceeat is the only one true healthy joint in Tacloban. With all the places we have to eat at that's savory, sweet and tasty, we do need a neutralizer for all the calories and fat we ingest. This is where Juiceat comes to play. Juiceat has multiple combinations of fresh fruit and vegetable juices geared towards cleansing, detoxifying and energy and immune system boosting that can only be good for our physical well being. Personally, I choose the concoctions myself for my blends and Juiceat is happy to oblige. For a stamina upgrade, it's carrots, oranges and apples; for cleansing, it's cucumber, citrus and apple for me. It is quite healthy and is just what we need and you know what they say about health - it is wealth! Prices: P90 for medium sized juices and P120 for the larger ones.